Nestled snuggly in the beautiful village of Palm Cove, Alamanda Palm Cove by Lancemore Great Barrier Reef, is your gateway to the adventure of the longest coral reef and oldest rainforest on earth. It is the only Palm Cove accommodation in the region to boast absolute beach frontage to the magnificent Coral Sea, which opens directly onto the awe-inspiring Great Barrier Reef. Alassio on the Beach is situated on the tranquil beachfront of Palm Cove, featuring studio, one, two and three bedroom apartments, built around ancient melaleuca trees, coconut palms and a freeform lagoon pool. The Palm Cove accommodation has palm shaded Mediterranean style balconies overlook the pool and the beach. Located 20km north of Cairns International Airport with a 30 minute drive from Port Douglas, Hotel Grand Chancellor Palm Cove is set on 3 hectares of beautiful tropical gardens, only 5 minutes walk to the beach. This Palm Cove accommodation features a restaurant & bar, swimming pool including kid's slide, and tour desk. Hotel Grand Chancellor Palm Cove is a place the whole family will enjoy. Imagine Drift is situated on the beach at exclusive Palm Cove, overlooking the Coral Sea. Just 30 minutes north of Cairns in tropical far North Queensland, this Palm Cove accommodation features a choice of luxuriously appointed self contained apartments, each with a large private balcony. Resort facilities include a free-form lagoon pool, gymnasium, day spa facilities and boutique shopping. 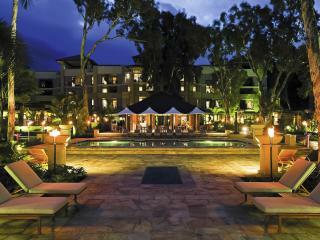 Mango Lagoon Resort & Wellness Spa offers an idyllic environment to revitalise and rediscover. Nestled among majestic old mango trees, 150 metres of swimming pools and lush tropical landscaped gardens and just a short stroll to the beach from your luxurious poolside Palm Cove accommodation. Mango Lagoon Resort & Wellness Spa has coral sea breezes fanning the palm fronds as it energises its way through the mountain side rainforest. Located on the beachfront in Palm Cove, Mantra Amphora offers hotel rooms and spacious apartments, many boasting breathtaking views of the Coral Sea. Palm Cove is more than an idyllic place to relax and unwind. 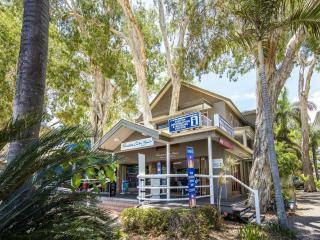 Stroll along the beachfront esplanade or wine and dine at the al fresco cafes and renowned beachside restaurants which are all close to this Palm Cove accommodation. This exclusive Palm Cove accommodation features luxurious fully air-conditioned 1, 2 and 3 bedroom apartments with large front and rear balconies. The complex occupies its own quiet cul de sac, and recreational and landscaped areas form approximately 70% of the generous 2.5 acre site which is host to a variety of tropical butterflies and birds and is elevated to capture the gentle sea breezes. Situated in the picturesque village of Palm Cove just 20 minutes north of Cairns, Palm Cove Tropic Apartments, offers one and two bedroom apartments set amongst the tropical palm trees and is only a short stroll to the white sandy beach. 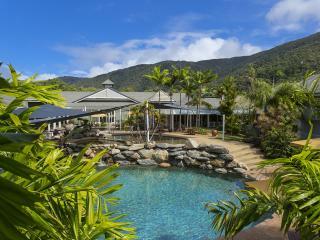 This Palm Cove accommodation offer value for money and is ideal for couples and families. Paradise on the Beach is a small boutique hotel perfectly located directly opposite the palm fringed beach in the heart of Palm Cove with fine restaurants and cafes just a few steps away. With studio and suites, this Palm Cove accommodation captures the unique North Queensland charm and character that makes any stay a relaxing one. Peppers Beach Club & Spa is one of the most sophisticated boutique resorts in Tropical North Queensland. Beautifully appointed Spa rooms and 1 & 2 bedroom suites overlook the palm-fringed beach at Palm Cove. Enjoy the lagoon swimming pool with cascading waterfall surrounded by fragrant gardenia blossoms. 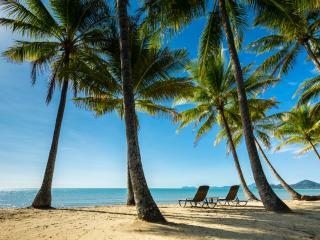 Cairns International Airport is a short 20-minute drive away from this Palm Cove accommodation. This Palm Cove accommodation offers a beautiful absolute beachfront location, just 25 minutes north of Cairns and 35 minutes south of Port Douglas. At the gateway to the Great Barrier Reef and the Daintree Rainforest, Pullman Palm Cove Sea Temple Resort & Spa is nestled in a region of outstanding natural beauty. This Palm Cove resort offers studio, 1, 2 and 3 bedroom apartments and penthouses perfect for a family holiday or relaxing couples getaway. Sanctuary offers luxury 1, 2 and 3 bedroom apartments in a resort setting. Understated attention to detail surrounds you the moment you enter. With each apartment full self-contained, its and ideal option for those who prefer to cook themselves, however there are plenty of dining options a short away on the main Esplanade. Sanctuary Palm Cove is a pure holiday experience that will never leave you. An intimate boutique hotel located opposite the beach at Palm Cove. A romantic and personal hideaway which captures the very essence of the tropics. White wicker furniture, mosquito net draped beds, air conditioned rooms with private VCR and CD players, superb award winning outdoor dining, 3 swimming pools, 2 spas, bar and cafe, and set in lush tropical gardens. The Reef House - MGallery by Sofitel is the ideal place to base yourself to explore the vast beauty of tropical North Queensland on your next family holiday or romantic getaway. This stylish Great Barrier Reef hideaway is just 50 metres from the idyllic beachfront of Palm Cove with suites, apartments and townhouses. Capturing the best features of a boutique resort, it is built around giant old melaleuca trees and tropical palms, and offers quality Palm Cove accommodation, seclusion and comfort in a traditional tropical North Queensland atmosphere. The Villas Palm Cove is the ideal place in which to base yourself for a Tropical North Queensland holiday. Featuring a range of 1, 2, 3 and 4 Bedroom Villas, this Palm Cove accommodation is perfect for couples, families and small groups. Enjoy the use of the self-catering facilities including full kitchen and laundry inside each villa. The Villas Palm Cove also features an outdoor swimming pool and spa, a great place to escape the heat.